For five years, Johnna Kredel baked treats for her rescue dog Herbie – named after Kirk Herbstreit – because she was frustrated by the treat options in pet and grocery stores. That question led Kredel to starting Nom Nom Nom: Natural Dog Treats. Nom Nom Nom makes fresh baked, high quality, preservative-free dog treats. And it provides a high quality dog treat you can trust and that the average pet owner can afford. 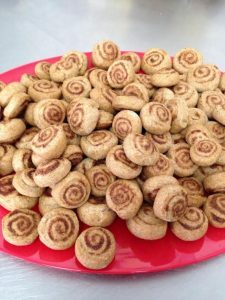 At Nom Nom Nom, Kredel makes wheat based treats, wheat-free treats, grain-free treats, and even vegan treats. They bake the treats fresh for each event they attend, and for each order received. Nom Nom Nom ships treats nationwide, but they also offer local delivery -for a small fee. And if you place a local order order for delivery Nom Nom Nom delivers your order the same day your treats are baked. “We say we have ‘the freshest treats in town'” Kredel proclaims. Their vegan treats (Peanut Butter Banana Bark, Carrot Crunch Bagels, Apple Pie Babies, and Pumpkin Buttons) are very popular. And there are also a large, soft baked Cinna-nom-nom Buns for Birthday and Gotcha Day celebrations. The Cinna-nom-nom Buns are their best-selling treat. Because, “who doesn’t love the idea of giving their pup a little cinnamon roll?” Kredel asks. Aside from offering tasty treats for pups, Kredel says she’s most excited about the overwhelming response Nom Nom Nom’s treats have gotten in the local communities. “We’re Ohio Proud partners and buy a combination of conventional and local ingredients to produce our treats. Watching our business grow is extremely rewarding, seeing your passion touch so many people and seeing the demand for our treats grow is very validating to a small business owner,” Kredel adds. You can pick up Nom Nom Nom treats at Worthington Farmers’ Market, Hilliard Farmers’ Market, New Albany Farmers’ Market, and Reynoldsburg Farmers’ Market. They’re also available inside North Market at Better Earth and Weiland’s Market. Later this year, they’ll also be available at Earth Fare in Columbus. In addition to farmers’ markets, Nom Nom Nom does several events around town, so check out their Facebook to find out more about these upcoming events. 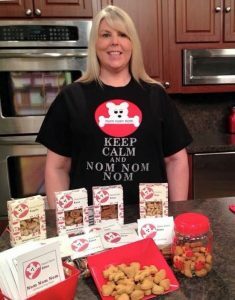 For more information on Johnna Kredel and Nom Nom Nom, pop over to their Esty store and check them out online at www.nomnomnomfordogs.com.